VISIONS OF THE NORTH: The Terror Bay "Tent Place"
The Terror Bay "Tent Place"
xi A. M. by guess time & this moment Tee-ke-ta has entered our Ig-loo & laid before me a fragment of a striped handkershief [sic] - as I suppose from its looks & a relic of Sir John Franklin's Expedition. I will now try & get the history of it. Tee-ke-ta, where did you get this? Ans. From Ki-ki-tung (KWI) from a tent found there. Who got it there? Ans. “Mong-er”. That is he (and) Tee-ke-ta. Three men saw this tent first - he, Tee-ke-ta, one of them. How long after you saw Ag-loo-ka was it before you and the two men found this tent? The next spring - that is, one year after. What did you see in this tent? Blankets, bedding & a great many skeleton bones, a great many skulls - the flesh all off, nothing except sinews attached to them - the appearance as though foxes & wolves had gnawed the flesh off the bones. Some bones had been severed with a saw. Some skulls with holes in them. On trying to get Tee-kee-ta to tell how many skulls there were in this tent, he says he cannot tell for there were so many - the tent floor seemed to be covered with bones & the tent much larger, longer, than this Ig-loo. (Our Ig-loo of oval form, the longer diameter being 25 feet.) Some of the skeletons had been completely cleaned of all flesh and sinews & [?] fastened to various portions of the dress that one might suppose to have clothed the living man. What else in the tent? Ans. Tin cups, spoons, forks, knives, two double barrel guns, pistol, lead balls, a great many powder flasks. If I or anybody else will go there in the summer after the snow has melted off the land will find a great many balls and see all the skeletons. Ahlangyah remarked that the books were are given to the children “for playthings.” Teekeeta also remembered this. Did you see the paper with such kind of marks or writing as you see here? Saw a good deal, as you express it, what Tee-ke-ta says. I now show Tee-kee-ta a book, Capt. Ross voyage of the Victory 8 vols. (French edition but in English) & showed him the difference between printed marks & writing marks & he says he and companions saw both kinds in tent. What did you do with the books & papers? Ans. As they were good for nothing for Innuits, threw them away, except one book which had pictures in it he brought home. Ans. All gone long ago. Gave it to the children & after a while all of it got torn to pieces. He says if any one goes there in summer he may find pieces of paper about there. Any boxes in that tent? Only one small box & something all metal, brass, inside, a sextant as Joe thinks. Now I have my large sextant (u.s.c.s. sextant) brought into igloo & he looks at the sextant and says it was not like that, it was round as one could see on opening the box. I now show him Eggert pocket chronometer & he says it was like that only much larger & the inside of it like inside my chronometer but all much bigger. Therefore this was a box chronometer. A good many watches found in the tent, found there in some of the clothes that covered some of the skeletons. Some with chains knotted around the necks of the skeletons. And I have a strong suspicion that HMS "Terror" herself may be quite near this place. I was trying to reconcile the map of the "site" in your last thread with this end of Terror bay....so traced it onto a piece of paper and then got google earth images and zoomed in to match the scale of the map, and couldn't find an exact match, but if you locate it just above where your "Tee" of Tee-ke-ta's in your label, it comes close.....right where that little river/stream flows from the pond/lake inland a bit. It moves the river slightly on the map, but doing this places the graves in an east/west alignment. Beyond that, more fascinating food for thought. Sadly, the papers being considered good for nothing is understandable but so frustrating! I can only imagine trying to survive an arctic winter in a tent. Wondering if some of the sawn limbs could have been frostbite treatment? This point is known as Nunariattaak, which means "May be where you go onto the land from the sea ice by dogteam", according to the Gjoa Haven Traditional Place Name page. Possibly the ice along the coast is too rough to the west. It is probably a good route to take when traveling by snowmobile too, so Sammy Kogvik might have passed this way the day he saw the mast. Randall, yes, I noticed that on the IHT map as well. I have heard that the location of the ship is at a place Inuit frequently cross over, then and now -- Louie Kamookak told me he'd probably gone over the "Terror" dozens of times in his skidoo. It would make perfect sense for the camp to be near the ship, and would line up with other Inuit testimony. Is the CanTopo map similar or not to any map that McClintock drew of Terror Bay ? If McClintock did follow the shoreline, how far was he from the sunken Terror , assuming the ship was near the Tent Place ? McClintock certainly sledged over ice in that May of 1859, would the Bay have been frozen over ? 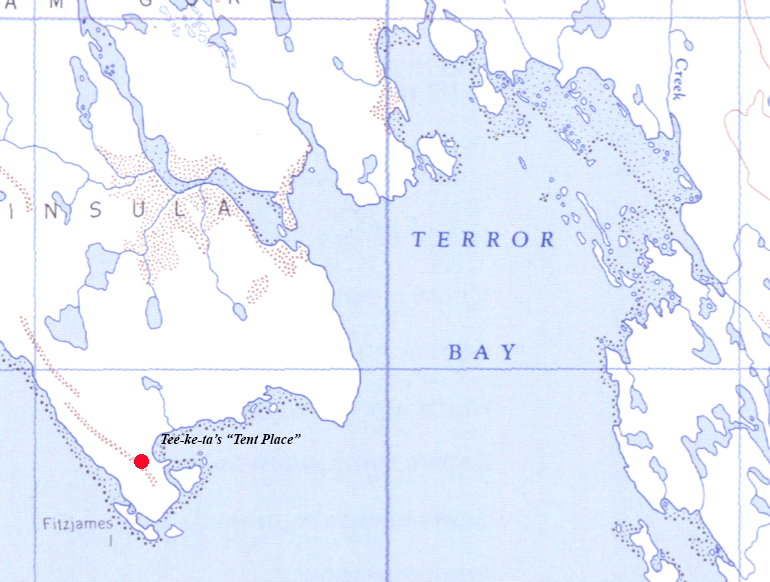 The location of the "tent place" as you indicate on the map seems straightforward, 'a little way north of Fitzjames Islet' and it has interesting similarity with Beechey Island topography. I rushed to get my copy of 'unravelling the Franklin mystery' and, low and behold, Woodman indicates in his book that there is confusion on the place because there 'was another place named Fitzjames Islet later' -- i.e. at the time of Hall, what is called today Fitzjames Islet was not the Islet that Hall was talking about in this text. hmmmm...? Will we know? Actually, I think Dave's book is mistaken about that -- he had thought that Fitzjames Islet was named much later, whereas in fact it was named by McClintock in 1859. A much easier fact to verify today with Google books than it was in 1992! OK! thanks. Lets get our metal detectors then, and go find the place with all that ball etc...! I would love to tag along on the metal detector trip if possible...bring my kids along for a different kind of holiday! It would be incredible just to stand there and truly think about what took place there. In something in the same vein as using the metal detector, I wonder what will happen with the finders of the Terror and the various gov't protocols they are now being investigated for for violating? Might want to hold off on the metal detector till that is resolved! I can understand all the deaths after the sinking of the ship, but it continues to baffle me as to the 24 deaths noted in the VP note, plus the other remains found down the west coast of KWI. It would be great to visit the site with a metal detector! But first, a class-2 permit, which requires consultation with local Inuit communities and the presence of a qualified archaeologist on the site. I'm hoping it will be looked at by someone next summer! Sadly there is a world of difference between an archaeological enthusiast (myself), and a qualified archaeologist! From my chair here though it seems so simple, a team of people walking line abreast with detectors all over that site. With the discovery of the Terror though, I have a feeling land archaeology will be taking a back seat to the water part. Ideally though, they should compliment each other. Don, thanks for your comment. In most recent years, ground archaeological work has always accompanied marine -- I hope and expect that will continue! Given the location of the Terror, and the subsequent events (bodies in tents, limbs missing etc) what does this do to the stories of a cache of wooden crates at Matty Island? It would seem reasonable to think that the ships came down the western shore of KWI and ended up as they did. Had there been a cache on Matty Island, surely the survivors would have made their way that way for supplies? As an aside, I just saw today where Parks Canada updated pictures of the Erebus, wow, it is in rough shape. These crates could have come from a ship's boat, or possibly been offloaded earlier when one of the vessels was probing "Poctes Bay" -- or they may be completely unrelated to Franklin. Ground work would be needed. And yes, Erebus is not quite so sound as she at first seemed. This gives new urgency to work there. So, when was this account recorded by Charles Francis Hall? If it is there, why hasn't it been found? It sounds like the location is pretty well established, no? Just wondering why it hasn't been found by now? Also, if not 129 remains (doesn't sound like it) then it makes me wonder about decision-making and judgement. Why weren't they all together?